Well he played his trump card, a special invitation he couldnee resist. Paul likes his seafood and fruit especially, here he could fill his boots with both. Was he intimidated by the name? Not on your nelly, being a McLean he knows he is welcome anywhere in the world, well maybe no a few places in Campbell Argyll. 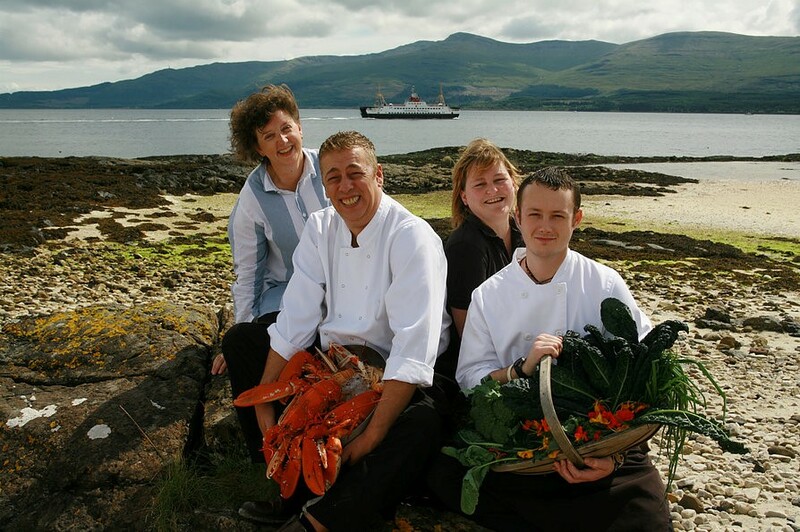 Just look at the photo here of the Whitehouse team, all smiling, even the lobsters have a grin on their faces, “the constantly evolving blackboard menu of local seafood, game and garden produce. Cooking is pleasingly unfussy and flavoursome.” Michelin Guide 2018. “The cooking is very fine indeed” The Good Food Guide 2019. It is produced, carefully sourced, simply served, a daily changing taster menu of up to six courses, menus reflect the seasons and the ingredients foraged and sourced locally. He just didnee want to leave, he does love this part of wild Scotland. So what are you waiting for? How do you find it? From the Isle of Mull: Take the Calmac Ferry from Fishnish to Lochaline. A five minute walk takes you to The Whitehouse. By car: From Fort William, take the A82 to the Corran Ferry. Take the ferry and turn left onto the A86. After 12 miles turn left for Lochaline . Follow the A884 until you reach Lochaline. The Whitehouse is 50 yards up on the right next to the shop. Telephone 01967 421777 Open Tuesdays to Saturdays for lunch and dinner. Paul’s advice; BOOK. https://www.thewhitehouserestaurant.co.uk Michael, Head Chef, started out as a coal miner. When the pits shut, he washed pots and slowly worked his way through the ranks in famous restaurants. He then set off around the world. On his return he met Jane and realised that she and Sarah had the same goal: to create a sustainable restaurant using really local food. Jane, a lawyer by day, opened The Whitehouse with Sarah in 2003. She is also a director of the Morvern Community Development Company and a judge in the International Marmalade Competition! Sarah co-owns, and runs Lochaline Stores and is the crew manager for the local volunteer fire service. She has a young family: Archie and Eadie, who regularly help head gardener Lesley. Sarah is a director of the Morvern Community Development Company. Lee started working in his local chip shop where he developed a passion for food. He took off for London’s top restaurants working his way in famous kitchens. He met Mike and joined The Whitehouse.